I am designing a helix twist container with 0.8 wall thickness, It comes out great and the nozzle movement is very optimized. I wanted to increase the wall thickness to make it a bit thicker for strength and I am seeing some really weird behavior in the wall. 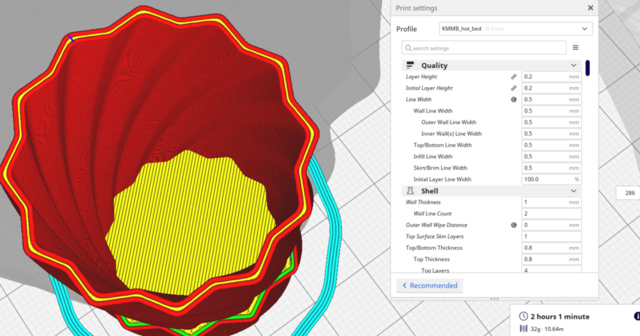 I have infill set to 15% Gyroid but that doesn't take affect in the middle part as the objects thickness is 1.2mm and my wall thickness setting is 0.8mm. The travel path for the nozzle to create this broken up inner layer of the wall is very erratic too increasing print time. Does anyone know why the wall would not be filled up on the inside and also why the really erratic pattern to fill the wall? The 0.8 mm thickness object prints quickly and cleanly. The 1.2 mm is problematic. I am using Cura 4.0. I also tried 3.4.1 and it had the same behavior. I downloaded another brand slicer to test and it generated a nice continuous inner wall so it doesn't appear to be an object issue. Hi @Adam324, I sliced your model using my Cura release and it looks really good. This is with 0.5mm wide wall lines and the wall gap fill enabled. Print time is around 2 hours, quite a saving! The wall gap fill produced by Ultimaker Cura releases tends to be rather zig-zaggy but this is nice and smooth as you can see. Thanks for that info. I will test it that way. That is interesting. I tried going thinner on the object thickness to 1.1 mm but that didn’t help much. It might have been filled a little more but it was still missing a lot of inner wall and still erratic. I do have fill gaps between walls enabled. Do you think I will lose any precision using a 0.5 mm line for a 0.4 mm nozzle? The twist container needs to fit pretty precisely so that it isn’t too tight or too loose. I can just reprint some test pieces to check the infill as long as the 0.5mm is consistent. I use 0.5 mm for the infill (when that applies) to give objects more strength. I am ok with that as I don’t really care about precision of the infill as much. I am still puzzled though why the wall was not filled up. It should be close to 0.4mm between the walls. I will experiment going to a thicker object (1.3 mm+) and see how Cura handles that with 0.4 mm lines. Further testing has to wait a bit though as I got a stomach bug from the younglings and I am now stuck in bed. This conversation is a nice distraction though :). Hello @Adam324, sorry to hear you are unwell, I wish you a speedy recovery. I pretty much always use a line width of 0.5mm with my 0.4mm nozzle and have never had any particular problems with precision. With a model such as yours, the width of that inner gap varies. You can see that clearly in my image above as the yellow gap fill is thinner where the wall outline is straightest and fatter where the wall outline curves more. If the inner (green) wall line width is such that it is close to the average width of the gap, in some places the gap will be smaller than the wall line width and in other places it will be bigger. Where the gap is bigger, the slicer will generate normal wall line segments (green) and then the gaps get filled with yellow. Thanks again for the reasoning for it. I guess we need a variable line width for printing inside walls feature (maybe a min and max) :). I made the object thickness 1.26 mm to make sure 0.4mm would fit for the inside wall and that helped. I went down to 1.22 mm object thickness and that still looked good. Going to 1.21 object thickness looked pretty good but it obviously was still having some issues as retractions went from 20 minutes (1.22) to 1 hour (1.21). I ended up just changing my line width from 0.4 mm to 0.34 mm to give more room for a 4th line to go down and that solved the problem as well as I think my underextrusion issue. I wanted to find a solution for 1.2 mm object thickness and not have to redesign objects to work around Cura behavior. I will find out soon. The path with 0.34 mm line width looks good and has a good flow even for the 4th pass (2nd inner wall) to fill the voids.